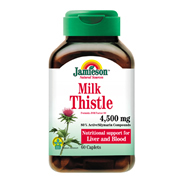 Milk Thistle helps give nutritional support for the liver and blood. Traditionaly used for the prevention and/or treatment of various liver disorders including viral hepatitis, fatty liver associated with long term alcohol use, and liver damage from drugs and industrial toxins. 80% Active Silymarin Compounds. Each caplet contains: Milk Thistle (Formula JSM Factor 80) 4,500mg. 80% Active Silymarin Compounds.